There’s nothing like the great outdoors to get you active and inspired. Fortunately, the South Shore area offers miles of walking paths and hiking trails including World’s End which features beautiful rolling hills, rocky shorelines and sweeping views of the Boston skyline and Wompatuck State Park which has a great introductory hike called the Heart Health Loop. The best part about hiking is that nearly anyone can do it, including families with children. You don’t have to be an experienced hiker or have ever even hiked before. Whatever your experience level, before you set out it’s important that you are aware of the most common hiking injuries as well as how to prevent and treat them. You’ve probably already had a blister at some point in your life, but they are a seemingly unavoidable part of hiking. Blisters form as the result of friction, which causes fluid to accumulate and swell between irritated layers of skin. Generally considered a minor injury, left untreated or treated improperly, blisters may lead to infection. To avoid or prevent blisters, wear socks and properly fitting shoes that are appropriate for the terrain you’ll be hiking as well as the weather conditions. You should also do your best to keep your feet dry. If you feel a blister coming on, apply a piece of athletic tape and moleskin to keep prevent it from rupturing. If it ruptures, drain any remaining fluid then apply antibiotic ointment to reduce the risk of infection. Cover the affected area with a Band-Aid and athletic tape. Depending on where you choose to hike, you’re likely to encounter a variety of potential hazards such as slippery surfaces, uneven terrain, rocks or other hidden obstacles that may increase your risk of a twisted or sprained ankle. Again, proper footwear that offers ankle protection can help prevent this type of injury. You should also use a hiking stick or other form of stabilizer to help you balance your steps. If you twist your ankle, your inclination may be to simply walk it off. However, you should take a few minutes to evaluate the extent of your injury. If you suspect a sprain, remember the acronym R.I.C.E. which stands for rest, ice, compression, and elevation. Some hikers, much like runners, may be more at risk than others for experiencing knee pain. Especially those who have had a prior injury, have weak or imbalanced leg muscles, knee caps that don’t track correctly, log a lot of miles on the trail or wear ill-fitting or worn out shoes. Even those without any of these factors may still experience knee pain and joint inflammation simply due to the amount stress the joint is placed under. Hiking uphill or on flat ground are one thing, but when you hike downhill your knees are placed under significantly more stress. As you descend one leg at a time, the leading knee is forced to absorb the impact of not only your body weight but also the added forces of going downhill and the weight of anything you might be packing. In fact, research indicates that the compressive force between the tibia and femur (or knee joint) is 7-8 times your bodyweight when going downhill. 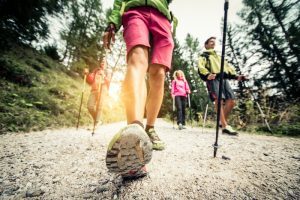 If you experience knee pain while hiking, the use of trekking poles can help redistribute some of the forces on your knees and ankles to your arms and shoulders. But the most effective way to mitigate knee pain is the strengthen the muscles that stabilize and support the knee joint such as your hamstrings, quadriceps, glutes and calf muscles. Wearing a knee brace or learning the proper way to apply Kinesio tape can help add external support. This should be a no brainer for anyone who spends time outdoors, but sunburn is one of the leading injuries commonly experienced by hikers. You should apply sunscreen 15 minutes before sun exposure and pack enough to reapply at least every two hours. The Skin Cancer Foundation recommends a broad spectrum (UVA/UVB) sunscreen with SPF 30 or higher for extended outdoor activity. To give you an idea of how much to carry with you, dermatologists say that two people on a four-hour hike on a sunny day should use an entire 4 fl. oz. tube of sunscreen if they are applying it properly. For added protection, you should also wear clothing made from UPF-rated fabrics and sunglasses that offer 100% UV-ray protection. Remember, filtered sun can still damage your skin so these recommendations still apply when conditions are cloudy. Heat exhaustion, heat stroke and hypothermia are among the most common hiking injuries. It’s important to know the signs and symptoms of each. While heat exhaustion may leave you feeling tired, nauseous and/or dizzy, symptoms are often relieved with rest, food and rehydration. Heat stroke, on the other hand, is considered life-threatening and may include symptoms such as confusion, delirium and loss of consciousness. What you might not realize is that even in summer, hypothermia can be a concern. This occurs when your body’s core temperature drops below normal and like heat stroke can lead to poor judgment, confusion, loss of consciousness and even death. If you plan to hike, in the days leading up to and during your hike, make sure you drink plenty of fluids, eat several small meals throughout the day and avoid alcohol and caffeine. With spring and summer approaching, it’s a great time to hit the trails. But keep in mind, accidents happen to even the most experienced and best-prepared hikers. It’s important to know how to rescue yourself if you experience a hiking injury. For fractures and other orthopedic injuries, contact South Shore Orthopedics. We understand that accidents and injuries happen unexpectedly, so when possible, we offer same day appointments. From diagnosis to surgery to rehabilitation, our board-certified orthopedic surgeons are here to help you every step of the way. Call (781) 337-5555 to schedule.